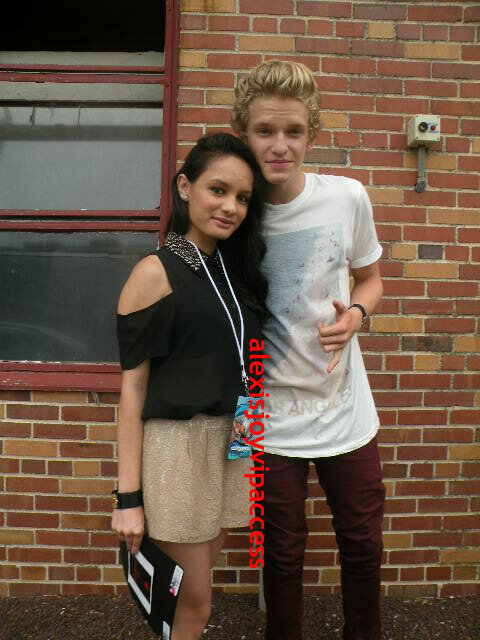 VIPAccessEXCLUSIVE: The Incredibly Talented Cody Simpson Talks Exclusively With Alexisjoyvipaccess! From performing at school concerts in his hometown of Gold Coast, Australia to having an upcoming performance at his dream concert venue; the Staples Center. From having his first single, “IYIYI” out to having his debut album release “Paradise” very soon. From a young boy who started his music career off by posting videos on Youtube to one of the biggest phenomenons out. That’s Cody Simpson, for you. Cody Simpson has been on tour for over a month now, and it’s just the beginning; and if you think the weather was hot already, Cody’s fantastic music and amazing choreography on tour totally made the summer temperature spike! I, Alexisjoyvipaccess chatted with Cody Simpson exclusively at his Jones Beach, NY concert and got the scoop on what it’s been like for him on tour. We all know that Cody Simpson is such a gentlemen; so I even asked him during our VIPAccessEXCLUSIVE interview what message he would bring out to guys to show that they are a gentleman too! Before I say too much, hear what Cody Simpson had to say for yourself below in my VIPAccessEXCLUSIVE interview with him! It was wonderful interviewing the musically dedicated, Cody Simpson and it’s always great seeing him! Alexisjoyvipaccess: Cody, your album “Paradise” is coming out very soon, can you tell us what we should look forward to with your album? Cody Simpson: Just like a lot of fun, summer records; a lot of dance records, beachy kind of songs; that’s got a real chill kind of vibe that I wanted to portray for a long time and I’m excited that I finally get to introduce myself proporly; and a lot of people are going to hear this album; so I’m really excited!! Alexisjoyvipaccess: Yes! And we can’t wait to hear it! So, a great thing about you is that you’re bringing chivalry back to this generation. If you could bring out one message to all the guys watching on how they can show they’re a gentleman, what message would that be? Cody Simpson: There’s so many guys right now, it’s fustrating to see that guys aren’t treating their girls or just girls in general like ladies and like they should be; and it’s important, you know, it shows in the way you act. You just have to put them first, and just open doors, pull their chair out; it’s just all that stuff that counts and I think girls really love when their guys do that stuff for them and it’s important to always put them before yourself. Alexisjoyvipaccess: Great, so guys take notes! Cody Simpson: Listen up, yeah! Alexisjoyvipaccess: So lastly, if you could bring out one message to all your fans watching, what message would that be? Cody Simpson: I’m going to keep it simple, and say my three words: I love you. Now that you have seen my VIPAccessEXCLUSIVE interview with the incredibly talented, Cody Simpson, make sure you are staying connected with him through all his social media! Also, don’t forget to buy Cody Simpson’s album, “Paradise” out on iTunes very soon! LOVED IT! I just simply loved your xclusive Cody Simpson video interview of Cody Simpson… and an update. You rock it ! And it’s just so nice to see young guys still believe in being a gentleman is not passe’ ! Cody is just a poster boy for classy,cool & cultured That just shows.Good breeding!